The fivesquid team were looking for strong financial partners to enable them to fulfill their credit scoring and micro loan products. Lodex was the answer. fivesquid, Lodex and BLOCKLOAN are excited to announce their strategic global partnership. The three companies are on an exciting high growth trajectory and driving innovative business models that dovetail together brilliantly. 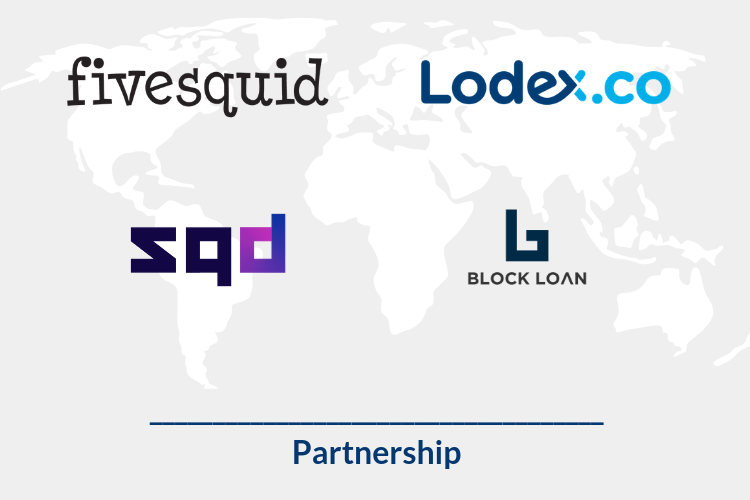 The fivesquid team have partnered with Lodex, a foundation business for BLOCKLOAN, as they were looking for strong financial partners to enable them to fulfill their credit scoring and micro loan products. fivesquid can leverage both Lodex and BLOCKLOAN’s technology, deep financial and blockchain industry insights. fivesquid is amid a private fundraising initiative to enable the launch of SQUID its cryptocurrency and associated blockchain based products. The SQUID ecosystem will include the SQUID coin (SQD), a SQD debit Card, the SQD Wallet and a community reward programme for fivesquid’s community. The cornerstone to the SQUID ecosystem will be the SQUID Credibility Score, which will become a viable alternative to the traditional but antiquated credit scoring system. Multiple data feeds from the fivesquid community will feed the deep learning and AI systems which will give a holistic view of the individual. The SQUID Credibility Score will open access to financial services to many freelancers who previously could not as they did not have a traditional credit score. By trading on fivesquid freelancers will start to build a score and will be reward in SQD for each data feed they share, both on and off platform. Through the use of both public and private blockchain and private keys, the SQUID team will be able to ensure that each member has complete control over who sees their data. The SQUID Credibility Score will provide a real way for the unbanked, many in developing nations, to become banked. To put this into perspective there are 1.7Bn unbanked people in the world and fivesquid sees great potential to offer inta-regional versions of its platform to tap into these incredibly underserved regionalised markets. fivesquid are already in conversations at government level in some key regions. This ‘scored’ community will soon become an attractive audience to companies offering an array of financial products. The partnership between fivesquid, Lodex and BLOCKLOAN is clearly a natural fit for all parties. Lodex will allow fivesquid to bring forward their plans to offer the SQD debit card and SQD Wallet and Lodex will soon be able to offer the fivesquid community credit facilities that many would never have been able to access previously. All companies independently selected Stellar as their blockchain provider which further cements the partnership. The companies are actively exploring other ways they can collaborate and further information will be released in the coming weeks. “The partnership with Lodex will enable us to bring great additional value to the fivesquid community. We are already exploring products and services we can collaborate on, such as the SQD Card and Wallet and the team at fivesquid are excited to see these come to fruition”.